Switch off those racing thoughts and let the Glo To Sleep deluxe help you fall asleep quickly. Feeling sleepless or stressed out? Are your struggling with sleeping difficulties and troubling thoughts? Switch off your mind! DELUXE Glo to Sleep mask is a safe, natural and effective way to help you get the sleep you need. Ancient wisdom joins with modern technology creating a revolutionary new way for you to clear your mind, quickly relax and get to sleep naturally. Sound Oasis DELUXE Glo to Sleep therapy mask will help you focus your mind on the process of relaxation and sleep - naturally and effectively. Whether it's for a full night's sleep or just for a nap, our unique, patent pending technology will help you fall asleep quickly, sleep deeper, stay asleep longer and wake up feeling rested. On the plane or the train, at home or in a hotel room - we wish you a great sleep. Product dimension : 11" x 3.5" x .75"
Package dimensions : 11.25" x 3.5" x 1.5"
Glo to Sleep mask is a revolutionary new idea that builds on ancient wisdom, to clear the mind, deeply relax the body, and lead to sleep. For thousands of years, enlightened ones have told us to close our eyes, look up and achieve a calm state of mind. Now, with Glo to Sleep™, you simply raise your eyes and gaze on a focal point of blue lights. Without any previous training, practice or concentrated effort, you can instantly stop repetitive and worrying thoughts and quickly achieve a deeply relaxed state that leads to sleep. Glo to Sleep therapy mask works to slow the frequency of the brain’s electrical activity, an objective shared with meditation and self-hypnosis. When an individual first lies down and begins to fall asleep, the body enters, what sleep experts call, Stage 1 sleep. The individual is still very close to being awake, but the brain begins to work more slowly. The body relaxes, and the closed eyes start to roll around. After several minutes, the individual sinks a little deeper, into Stage 2 sleep. Once the body and mind really relax and the individual falls deeply asleep, they enter Stage 3. The heart slows down, and breathing becomes more slow. Finally, the individual sinks into the deepest sleep of all - Stage 4. 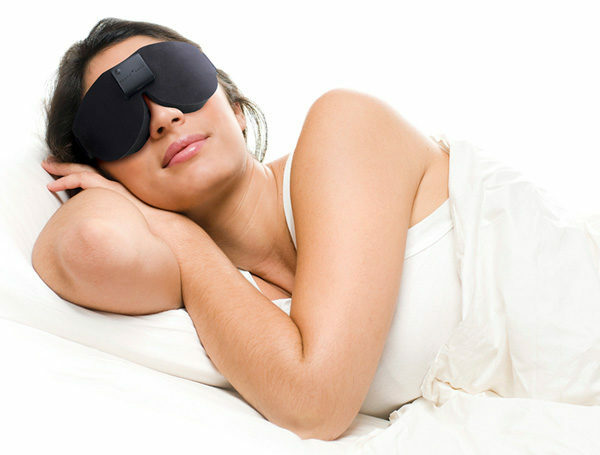 When using the Glo to Sleep mask, the objective is no longer trying to fall asleep. Simply raise the eyes, hold the gaze on a blue point of glo and breathe deeply. Thoughts slow and the mind clears. The body relaxes and arms and legs feel heavy. The eyelids begin to feel heavy as the individual continues to gaze at the Point of Glo. What happens next is what many Glo to Sleep therapy mask users find so amazing: the transition from consciously looking up at the blue Points of Glo to the first stage of sleep often seems instantaneous. At no time is the user thinking "they must get to sleep". 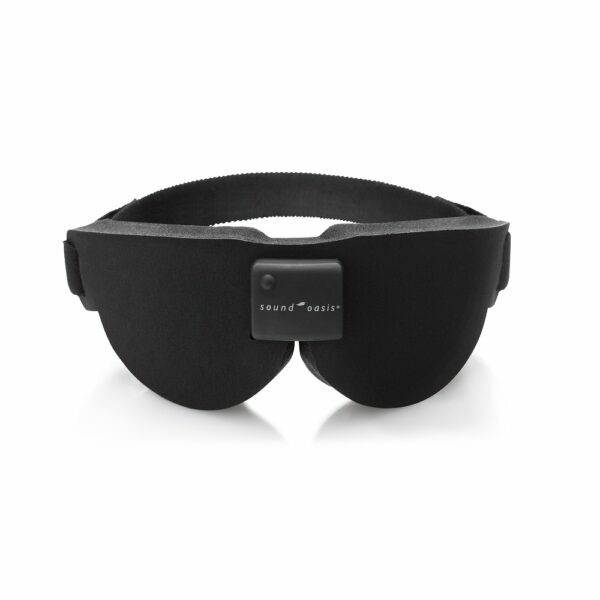 The Glo to Sleep mask rapidly slows the brain's activity level to a deep relaxed state. Looking up at the blue Points of Glo will be the last thing the user remembers upon awakening. Both subjective and objective examinations agree, meditation, self-hypnosis and the Silva Alpha technique, all demonstrate that raising the eyes and finding a focal point can aid in relaxation by lowering brain-wave frequencies. 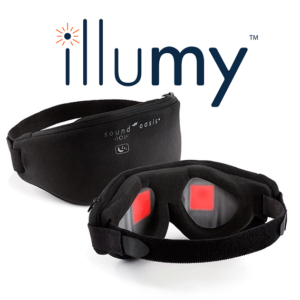 The Glo to Sleep therapy mask shares fundamental mechanisms, in regards to the interconnecting physiology of the brain and eyes, with meditation, self-hypnosis and the Silva Alpha technique. If an individual is looking for a resolution to their sleeping problems, but does not have the time or inclination to learn and practice relaxation therapies, the Glo to Sleep therapy mask is an ideal solution. 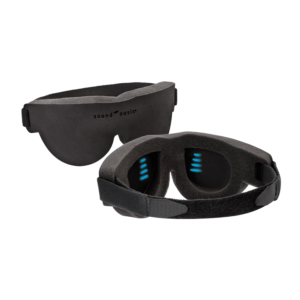 The Glo to Sleep mask will allow the individual, whether they have chronic insomnia or struggle to get to sleep a few nights a month, to relax quickly, clear their mind and get to sleep naturally. If you are lying in bed awake – thinking or worrying – your brain is generating faster beta waves. In order to fall asleep, you need to slow your brain activity down to the alpha wave state. In the alpha wave state, your mind and body are relaxed – the bridge between awake and asleep. For centuries, meditation has been widely used in many cultures to achieve a state in which no thoughts come in to mind. The technique used to achieve this, is to focus the attention, looking upwards to a point between the eyebrows – commonly known as the third eye or spiritual eye. Scientists now understand that this act of looking up influences brain wave patterns. Research has proven that by raising the eyes – with meditative training, practice and concentration – the relaxed alpha wave state can be reached. your eyes open, looking up at a Point of Glo. The brain and eyes form a subconscious monitoring that is working when we are awake and alert. This monitoring system performs an important system orienting task. If the eyes roll up, the brain stops receiving orienting information, and an individual’s level of awareness is altered. Q: What do the lights in Glo to SleepTM do? The gentle lights (we call the Points of Glo) give you something to focus on or gaze up at, so your brain is distracted and can relax as you concentrate on the lights and breathing, rather than the worries of the day, what needs to get done the next day, etc. This meditative principle is natural and successfully used everyday by millions of yoga and mediation enthusiasts. Q: Can you give me examples of people that have used Glo to Sleep mask? Yes! Please refer to the testimonial section for actual customer comments. Here is one comment from movie and TV star Ernie Hudson (Ghostbusters, The Crow, Oz). "I'm speechless. For the first time in nearly 20 years, I've been able to sleep through the night. I occasionally awaken, but only for a brief few minutes, compared to my usual 2-3 hours of tossing and turning trying to get back to sleep. What's even more amazing, I haven't had to get up to use the bathroom at night. I've been telling friends and family, so I expect you'll be getting e-mails and calls. My wife wants to get one of her own and I told her I would e-mail you and ask for one for her. But this e-mail is to say thank you. With all the reports coming out about sleep deprivation, I believe "Glo to Sleep" is a life saver. If I can be of any assistance, please do not hesitate to ask." Q: Do I have to stare up at the Points of Glo to experience the full effect of Glo to Sleep mask? No, but it is best to gaze naturally at the Points of Glo, allowing your eyes to move up and down the four rows of lights. It is O.K. to blink. The simple act of "looking up" at the Points of Glo relaxes the brain - this is a commonly followed element of meditation. Q: My eyes tend to be sensitive, and I'm concerned that the lights might hurt my eyes or be too bright. Glo to Sleep's Points of Glo are not bright enough to keep you awake – they only emit the light that they absorb from a light bulb or the sun. The brightness of the Points of Glo will automatically fade over several minutes. Q: Can Glo to Sleep's Points of Glo interfere with my sleep? Q: If I awaken during the night, do I have to recharge the Glo to Sleep mask? The photoluminescent bars (Points of Glo) will lose most of their brightness over a period of several minutes. Some dim light may exist for hours and it may be enough to gaze at. Q: Can I adjust the Glo to Sleep mask to properly fit my face? Yes. 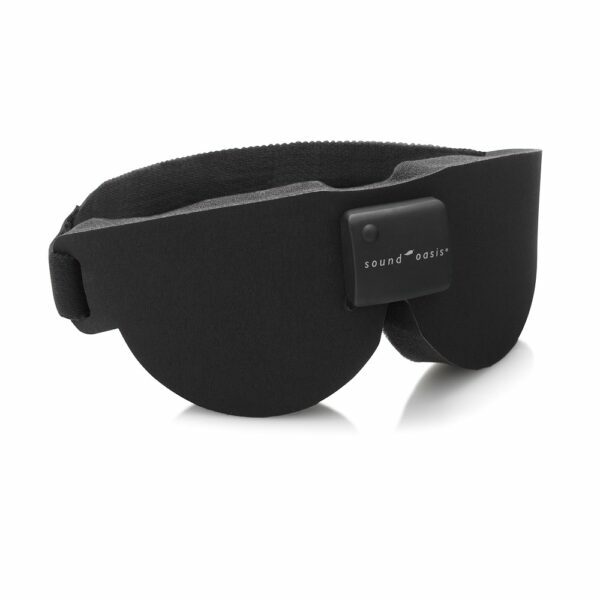 Glo to Sleep therapy mask has an adjustable Velcro® strap and supersoft hypoallergenic foam that allows you to fit the Glo to Sleep mask to your face so it blocks out all external light, yet it is comfortable to wear. Q: Why should I spend $39.99 for a sleep mask? 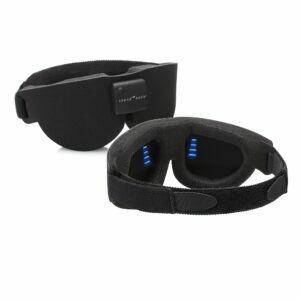 Glo to Sleep is not an ordinary sleep mask. 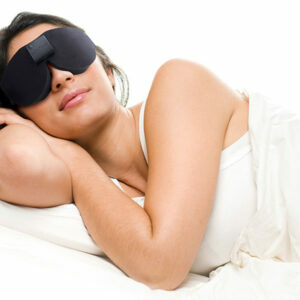 It actually induces sleep using natural, noninvasive technology. It is also made of premium hypoallergenic materials and does a remarkable job blocking out unwanted external light without getting in the way of your eyelashes. Q: I bought a Glo to Sleep and it isn't working for me. What should I do? It does happen that some people do not have immediate success with Glo to Sleep therapy mask. Please review the "How To Use Glo to Sleep" instructions (included with product and available on this web site). If Glo to Sleep mask does not help, simply contact our customer service department for a full refund. A DREAM COME TRUE: How much do I love this mask? So much that I actually dream about it. I kid you not. I struggled for years with insomnia, sleeping pills, despair, desperation, useless herbs. It took a few nights to get used to the mask, but now I fall asleep drug-free (a miracle), and most crucial of all, am able to fall back to sleep if I wake during the night or too early in the morning. I combine the mask with a CD of ocean waves (which did not work on its own); now, I am "trained;" as soon as that mask goes snugly on my head and I click on the magic blue lights--which take on a marvelous 3-D effect within the privacy of the mask--I'm quickly off to the land of nod. And it's absolutely the best light-blocking mask ever--even in full sunshine, it provides utter darkness. I might as well be at the bottom of a mine. I recently had a dream where I was demonstrating the mask, strapping it onto someone's head as if it were a magical object in a mythical story. Which it practically is, considering the difference it's made in my life. "It actually arrived on my birthday which was the best present. 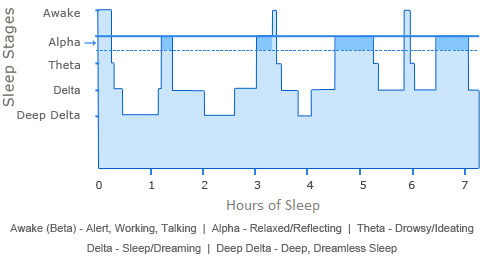 Since January j have had the best sleep of my life. It’s like I have my own personal sleep space and nothing can get in…." "I’m speechless. For the first time in 20 years I have been able to sleep through the night. I believe the Glo to Sleep™ is a life saver…." "Thank you very much. I didn't think it was going to work. It just worked unbelievable! I did not get up even one time. I love it! ""I know it must work because I don’t have any trouble going to sleep anymore and rarely wake up in the night. I took it with me on trip to Europe a few weeks ago and used it on the plane; it’s the first time I haven’t had jet lag and I’m sure its due to the Glo to Sleep™…." "I rarely endorse products, but when I do it's because I personally use the product and love it. Sound Oasis gave me a Glo to Sleep mask in 2014 and I have been using it at home and when I travel ever since. Best features: it's lightweight and totally blocks out all light helping me fall asleep and stay asleep."